Five-piece "Malitte" cushion system. Five polyurethane foam forms upholstered in a plush jersey fabric: four in red and one in dark blue, the forms can be displayed together as a vertical stack, or taken apart and used as a variety of seat forms. The red pieces (.1-.4) have a flat underside, two flat sides, and two sides of varied ovoid forms. The blue piece (.5) has two flat ends and is of ovoid outline. 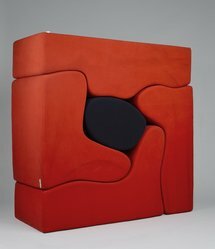 Designed by Roberto Sebastian Matta, made by Gavina (c.1970), distributed in the United States by Knoll International, Inc. CONDITION - New.